As a Group, you choose which categories you want to track. In the categories section, you can create, edit, and remove categories. You can also see what churches have linked to your categories. From the admin, select "Categories" to view the categories page. Select "Create Category" to add new categories to your group. Click "View unlinked Churches" to see any churches that have yet to link the categories you setup. Click "Edit" If you need to change a category&apos;s name or description. Click "Delete" to remove the category. If you clicked the "Create Category" or "Edit" link you will be taken to the category page. You can change the name of the category here. Add a description for your churches to see when they are linking their categories. Select if this category is a number or currency value. 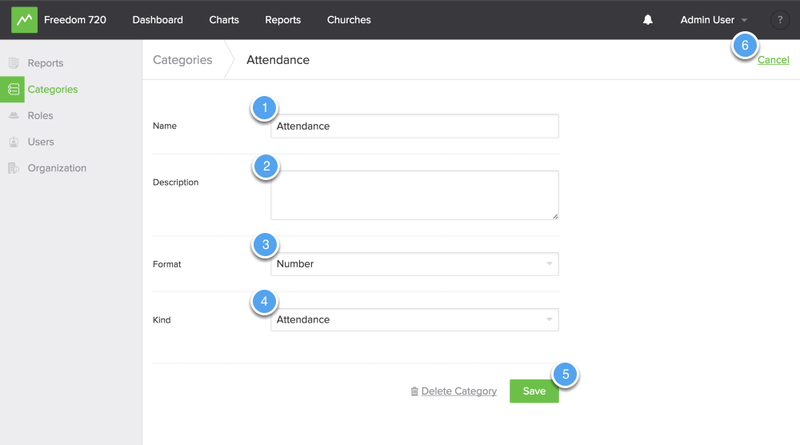 This will let Church Metrics know if it should show your data in decimal form. Select the category type. You can choose, "Attendance", "Salvations", "Contributions", or "Other". Be sure to save your category. If you need to cancel any changes, click here. If you have clicked the "View unlinked Churches" link, you will be taken to the "Unlinked Churches" page and be able to email any churches that have not linked to your categories.